The Postal Museum marked Art Fund Museum of the Year shortlist with short film projected onto famous London landmark. 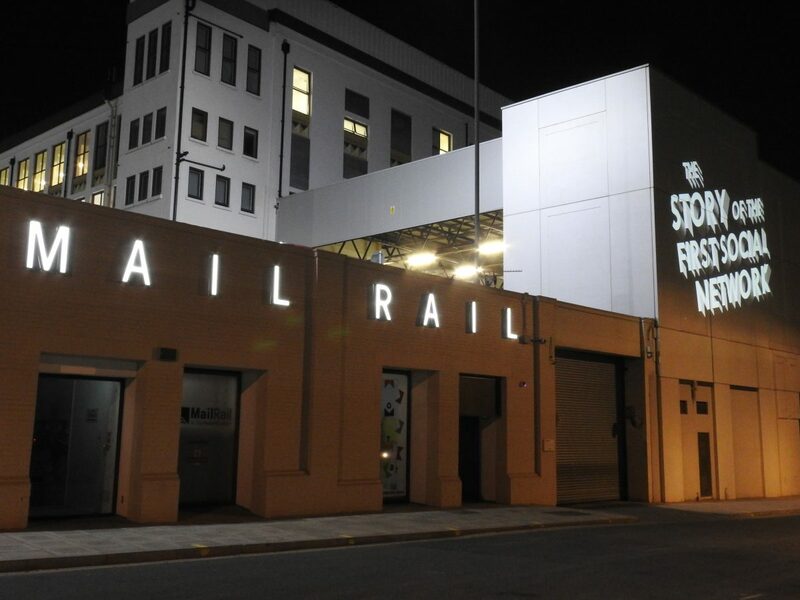 Earlier this month we turned part of London’s iconic Mount Pleasant Sorting Office in Clerkenwell into an outdoor cinema screen, projecting a specially commissioned short art-house style film onto its façade to celebrate the five finalists for the prestigious Art Fund Museum of the Year Award. Shot in black and white in the style of the General Post Office (GPO) Film Unit’s emblematic 1936 documentary Night Mail, the five-minute film was broadcast on Thursday 5 July, the same evening the winner was announced at a ceremony at London’s V&A Museum. The enormous projection revealed the winner of the Art Fund Museum of the Year Award – Tate St. Ives – shortly after the announcement was made. The short film follows the original route of the historic Postal Special train, which transported post from London’s Euston station to Glasgow, Scotland. It stops along the way to unveil stories from The Postal Museum’s collections linking to all five Museum of the Year finalist towns. The true story of two suffragettes who posted themselves as ‘human letters’ to Downing Street in 1909, determined to make themselves heard (Glasgow Women’s Library). All footage is interspersed with iconic footage of the Down Postal Express cutting its way across Britain’s impressive landscape. Supported by Art Fund, the £100,000 Museum of the Year prize is designed to get to the heart of what makes a truly outstanding museum. Presented every year, it is the biggest museum prize in the world and the largest arts award in the UK. It seeks out innovation and exceptional achievement in museums and galleries across the country and works to encourage more people to visit.